Krabi is high on the list of foreign beachgoers visiting Thailand. Thailand continued to position itself as a destination for travellers to visit by staying in the top 10 in the latest report by the UN travel agency. With 35.4 million visitors in 2017, the kingdom dropped one spot from ninth in 2016 to 10th last year, the World Tourism Organisation (UNWTO) said in its recently released tourism highlights. France remained the most popular destination, with 86.9 million travellers, while Spain overtook the United States as the second most-visited destination when it recorded 81.8 million international arrivals, compared with 75.9 million in the US. 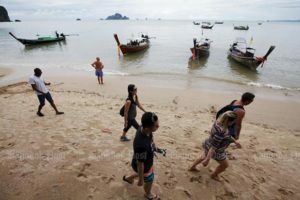 Thailand remained fourth in tourism earnings, with US$57.5 billion, while Macao and Japan cracked the top 10 for the first time. The top three countries enjoying the most spending from visitors were unchanged, led by the US ($210 billion), Spain ($68 billion) and France ($60.7 billion).